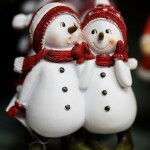 When planning your favorite holiday recipes, consider how you might make them fit in your healthy lifestyle. An easy way to do this is to make simple swaps. Weight Watchers products and endorsed products are perfect for making these swaps. For example, you might use Weight Watchers 100% Whole Wheat bread in your stuffing or Weight Watchers shredded cheese in your au gratin potatoes. These simple swaps help you eat smarter during the holidays. If you are on Weight Watchers, you know that they have a recipe builder on the site so you can add your ingredients and get the points for your recipe. With this, you can easily see how making simple swaps can help lighten up your favorite holiday recipes. 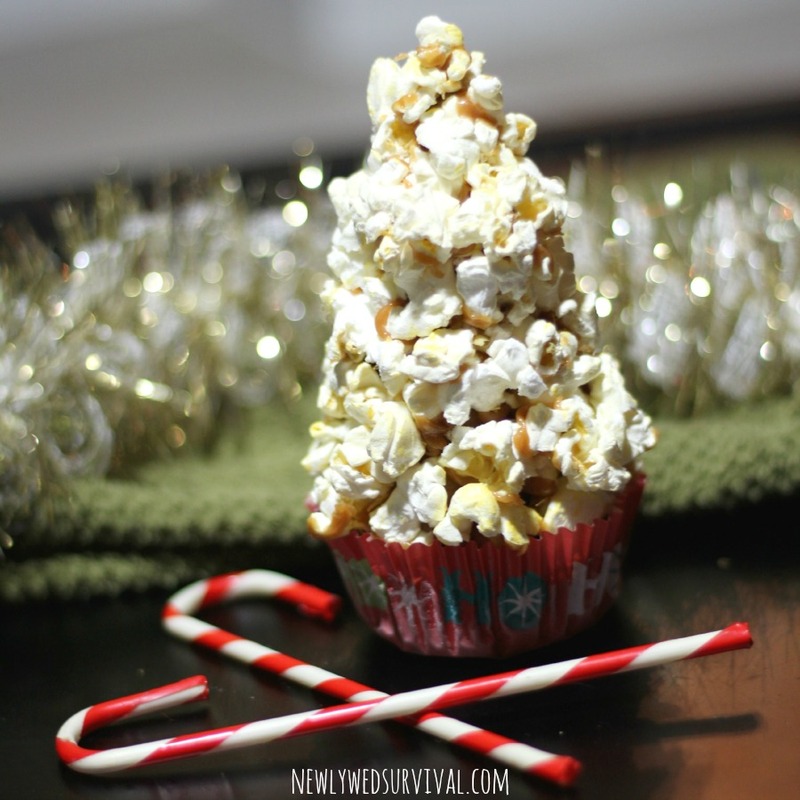 These popcorn Christmas trees are a fun and easy holiday dessert idea. They are a great combination of sweet ice cream, crunchy popcorn and gooey caramel. I decided to try to make these treats a bit lighter by making some smart swaps. 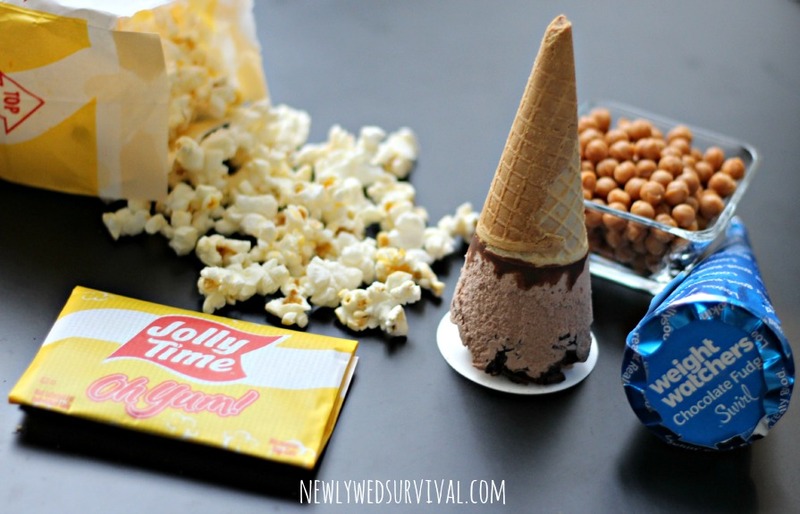 I used Jolly Time popcorn and Weight Watchers chocolate fudge swirl ice cream cones. 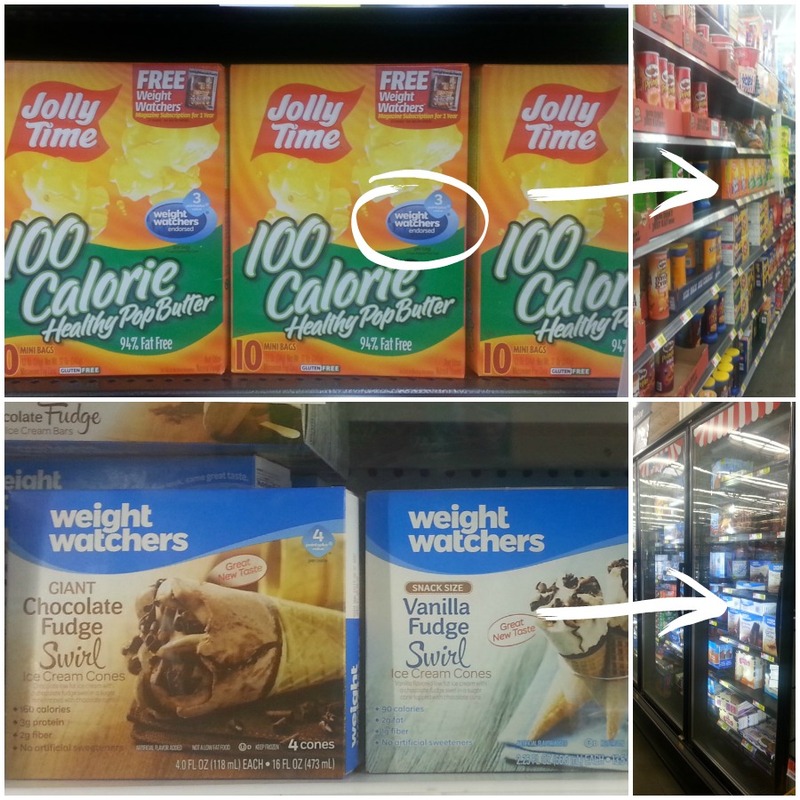 Jolly Time 100 Calorie microwave popcorn is endorsed by Weight Watchers. The Weight Watchers cones have a PointsPlus value of 4 each. You could make these treats even less points by using the snack size ice cream cones from Weight Watchers (2 points each). Like I said before, these are really easy to make. However, adding the popcorn can be a bit time consuming. It goes a lot faster if you work with a partner, so why not get the hubby involved. Make the two bags of popcorn according to the directions on the box. TIP: Make an extra bag so you can munch on that instead of the ones you are supposed to be putting on the cones! Put 6 cupcake wrappers in a muffin tin. Unwrap the cones and place one upside down in each cupcake wrapper. Once the ice cream has softened a bit, press down on the cones until the ice cream can’t be seen above the cupcake wrapper. TIP: Make sure the cone isn’t crooked – check all angles (the one on the right below is a bit crooked!). Put muffin tin in the freezer so the ice cream can harden. Meanwhile, take about 1/4 cup of caramel bits in a microwave safe bowl and put them in the microwave for 15 seconds and stir. Keep repeating for 15 seconds more until the caramel is completely melted. Remove one ice cream cone from the freezer and place it in a small bowl. Dip a piece of popcorn in the melted caramel and place along the edge of the cupcake wrapper – with caramel side against the cone. Repeat until you have filled the edge of the cupcake wrapper. TIP: The caramel is going to get hard pretty quickly, so you are going to need to put it back in the microwave for 15 second intervals often. Continue working your way up the cone. If needed, break the popcorn into smaller pieces to fill in any spaces. Put the finished popcorn tree back in the freezer and repeat the steps for each of the other cones. I serve them right away, but you could leave them in the freezer until you are ready to serve them. 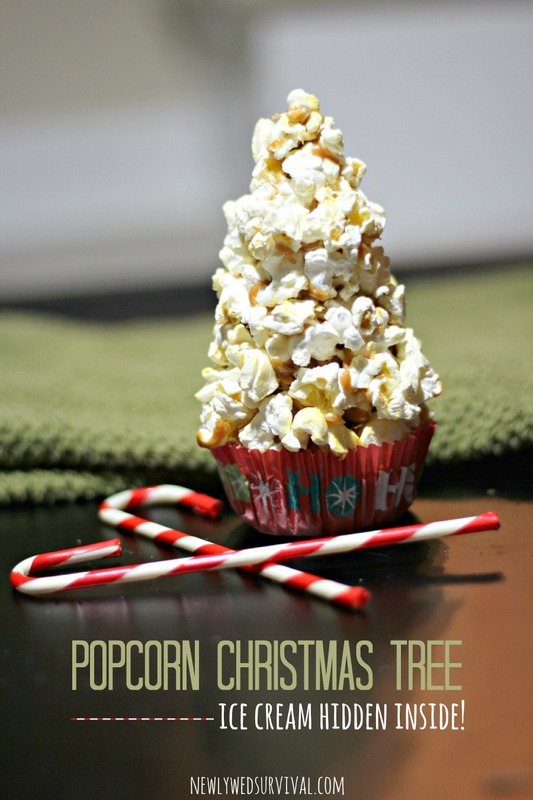 TIP: If you want the popcorn to stay crunchy, don’t leave the popcorn Christmas trees in the freezer for more than a few hours. You may be wondering how the heck you eat these things. Just grab the popcorn cone and hold it like an ice cream cone. Peel off the cupcake wrapper and eat it like you would any cone! 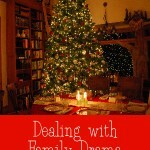 I was able to pick up all of the necessary ingredients for the popcorn Christmas trees at Walmart. 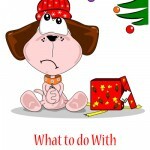 They have a lot of Weight Watchers products and Weight Watchers endorsed products. Just look for the name on the packaging! The PointsPlus value is given right on the package! A #SmarterTreat for the holidays. 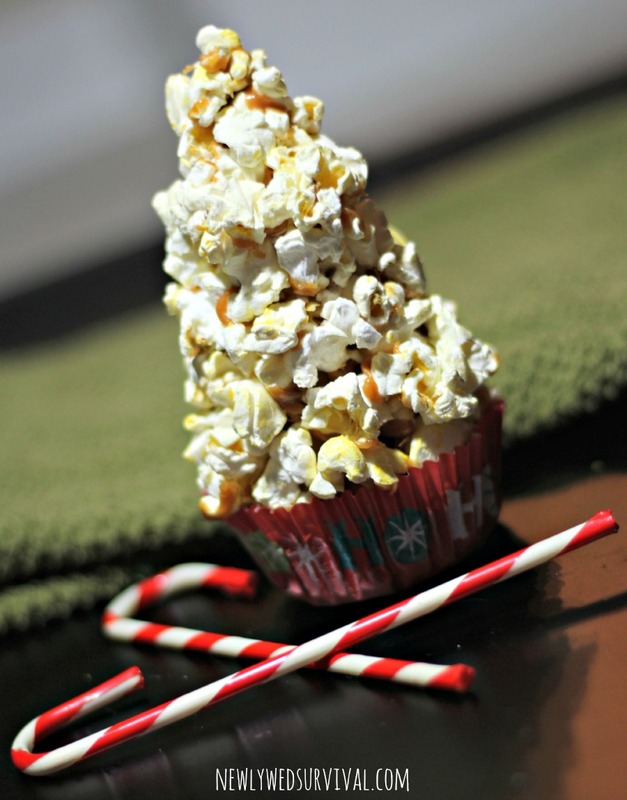 Put 1 bag of Jolly Time 100 Calorie popcorn in the microwave (follow directions on package). Repeat for the second bag. Put 6 cupcake wrappers in a muffin tin. Unwrap the cones and place one upside down in each cupcake wrapper. Let them sit for a minute or two until the ice cream softens a bit. 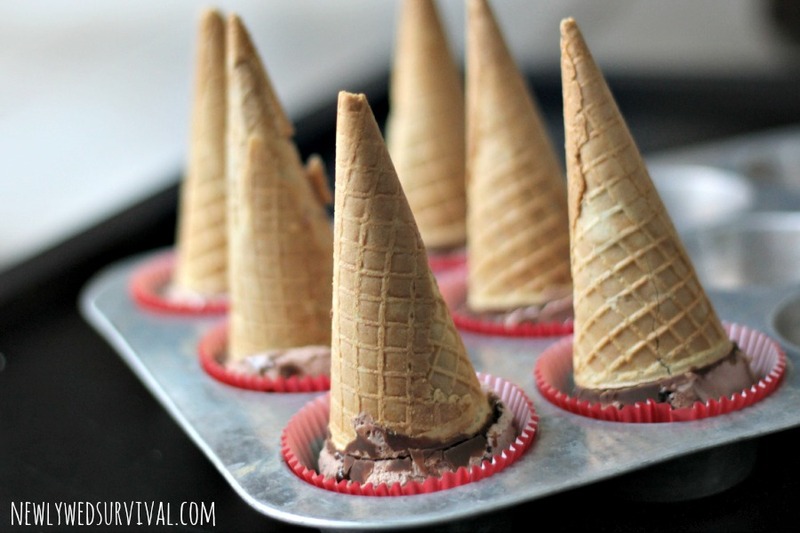 Press down on cones until the ice cream can't be seen above the cupcake wrapper. Make sure the cone isn't crooked. Put muffin tin in the freezer for at least 5 minutes. Meanwhile, take about 1/4 cup of caramel bits in a microwave safe bowl and put them in the microwave for 15 seconds. Take out and stir with a spoon. Repeat for 15 seconds more until the caramel is completely melted. 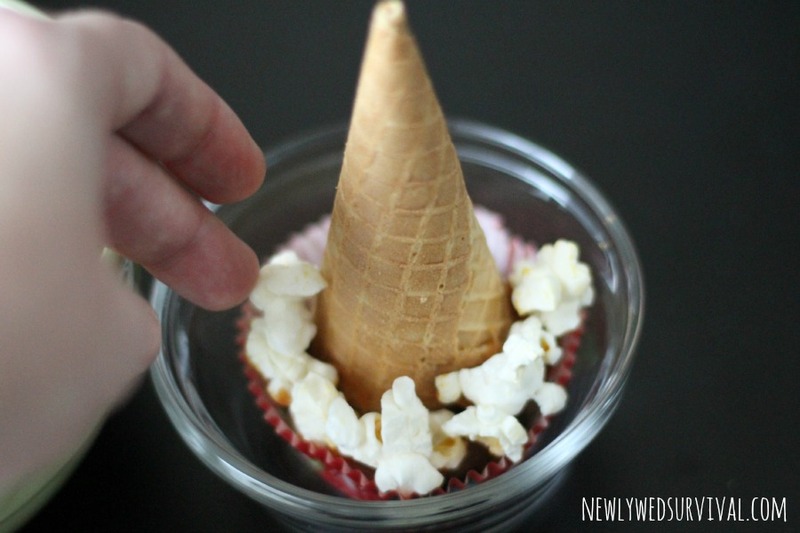 Remove one ice cream cone in a cupcake wrapper and place in a small bowl. Dip a piece of popcorn in the melted caramel and place along the edge of the cupcake wrapper - with caramel side against the cone. Repeat until you have filled the edge of the cupcake wrapper. Continue working your way up the cone. If needed, break the popcorn into smaller pieces to fill in any spaces. Put the finished popcorn tree back in the freezer and repeat the steps for each of the other cones. Eat right away, or leave in freezer until ready to serve (not longer than a few hours or the popcorn will lose its crunch). You can make these smaller by using the Weight Watchers snack size ice cream cones. If you like this idea, make sure to check out more delicious Weight Watchers recipes from other bloggers. Which of the #SmarterTreats is your favorite? That's so adorable, I honestly thought it was just all popcorn shaped into a tree. I never imagined it would have ice cream underneath! How did you know I was wondering how to eat it? LOL. That's really creative, I like it! So unique! all of my favorite treats in one. I'm going to have to try this real soon. I'm on WW and 14 years ago I lost 60 lbs, and back on it again to drop 20...and well, as you might know, it's a lifetime change.. not a diet and done. I have to say, this looks YUMMY. BTW, did you know WW made a plan change. What an adorable and simple holiday treat! Popcorn with ice cream is so super yummy!